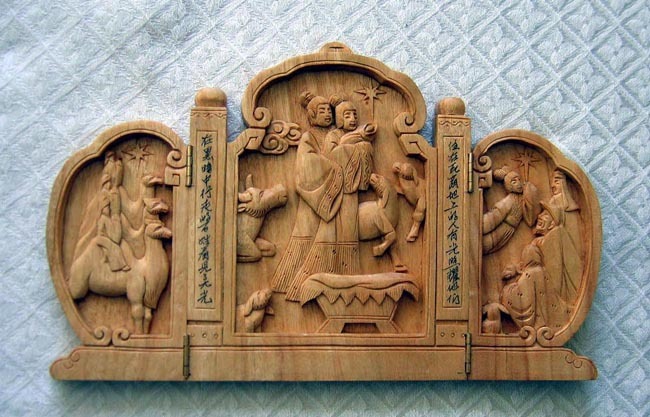 This standing Nativity ​plaque is carved in a triptych style (three panels that are hinged together). The wood is aromatic camphor wood with a light finish. The three wise men on their camels are on the left panel. The scene of the angel appearing to the shepherds is on the right panel. The center panel shows the Holy Family with three lambs and a water buffalo (see above for symbolism of this animal). Note that all three panels display the Star of Bethlehem. The Chinese characters written on both pillars are Isaiah 9:2, which reads, "The people that walked in darkness have seen a great light: those who lived in a land of deep darkness, upon them hath the light shined.” This scripture is a beautiful prophecy of the coming of Christ. The characters on the left side of the Nativity are the first part of the scripture up to the colon, and the rest of the scripture is on the right side. The item is 6.5 inches tall x 10.5 inches wide.